The global structural heart devices market is driven by surge in demand for minimally invasive procedures, increase in the geriatric population, and rise in prevalence of structural heart diseases. The global market was valued at US$ 9,444.9 Mn in 2017 and is projected to reach US$ 18,692.1 Mn by 2026 at a CAGR of 7.9% from 2018 to 2026. Structural heart devices are used in minimally invasive procedures to treat structural heart diseases such as mitral valve replacement, prosthetic heart valve replacement, and aortic valve replacement. Transcatheter heart valve replacement is one of the minimally invasive procedures for the treatment heart valve disorders. It enables physicians to conduct valve replacement surgeries via a catheter passing through the body’s cardiovascular system, thereby eliminating the need for traditional or conventional surgery. High prevalence of structural heart diseases, rise in ergonomic health approaches, increase in research & development initiatives, and surge in demand for heart valves fuel the growth of the global structural heart devices market. The global structural heart devices market has been segmented based on product, procedure, indication, and region. In terms of product, the market has been classified into tissue heart valves, transcatheter heart valves, mechanical heart valves, occluders & delivery systems, annuloplasty rings, and other devices. The transcatheter heart valves segment accounted for major share of the global market in terms of revenue in 2017. The segment is projected to expand at a high CAGR during the forecast period. It is anticipated to gain significant market share by 2026. Based on procedure, the global structural heart devices market has been bifurcated into replacement procedure and repair procedure. The replacement procedure segment is expected to expand at a higher CAGR from 2018 to 2026. Availability of new and innovative devices in the market and increase in preference for transcatheter aortic valve replacement (TAVR) procedure are likely to drive the segment during the forecast period. In terms of indication, the global structural heart devices market has been categorized into valve stenosis, valve regurgitation, cardiomyopathy, congenital heart defects, and others. The valve regurgitation segment is projected to expand at a high CAGR from 2018 to 2026 owing to rise in incidence of leaking heart valves globally. Based on region, the global structural heart devices market has been segmented into North America, Latin America, Europe, Asia Pacific, and Middle East & Africa. North America dominated the global market in 2017. It is projected to gain market share by 2026. The region’s dominance is attributed to increase in new options for mitral valve disease treatment. In July 2017, the FDA approved the third generation of MitraClip for treatment of people with mitral regurgitation (MR). Europe has favorable government policies regarding health care infrastructure and awareness programs for structural heart disease patients. The market in Asia Pacific is expected to grow at a rapid pace due to rise in population, changes in lifestyle, increase in the number of structural heart diseases, and surge in per capita health care expenditure. Additionally, economic growth and rise in distribution channels support health care infrastructure improvement in developing countries such as India and China. These factors support the growth of the market in Asia Pacific. The market in Latin America and Middle East & Africa is projected to expand at a moderate growth rate from 2018 to 2026. Abbott, Boston Scientific Corporation, Braile Biomédica, CryoLife, Inc., Edwards Lifesciences Corporation, LivaNova plc, Lepu Medical Technology, and Medtronic accounted for major share of the global structural heart devices market in 2017. Medtronic is a multinational company that offers medical devices, services, and solutions that alleviate pain and restore health. The company has over 65 years of experience in manufacturing and distribution of medical devices. It offers a broad portfolio of structural heart devices. Companies are adopting the strategy of acquisition and collaboration with parallel companies in order to improve and strengthen geographic presence in the global market. In December 2017, Edwards Lifesciences Corporation acquired Harpoon Medical, Inc. to increase presence in heart repair for degenerative mitral regurgitation. This report analyzes the current and future scenario of the global structural heart devices market. High prevalence of structural heart diseases, increase in demand for minimally invasive procedures, rise in in research & development initiatives, and surge in awareness about valve regurgitation and valve stenosis are factors driving the global structural heart devices market. Based on product, the global structural heart devices market has been segmented into tissue heart valves, transcatheter heart valves, mechanical heart valves, occluders & delivery systems, annuloplasty rings, and other devices. In terms of procedure, the global market has been categorized into replacement procedure and repair procedure. Increase in heart valve replacement procedures is anticipated to propel the structural heart devices market during the forecast period. The market size and forecast for each of these segments have been provided for the period from 2016 to 2026, along with their respective CAGRs for the forecast period from 2018 to 2026, considering 2017 as the base year. 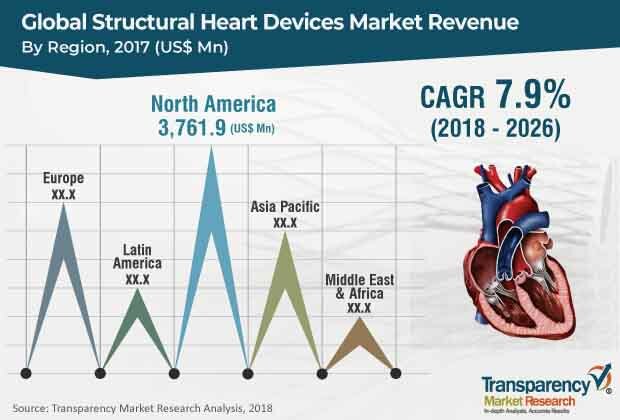 In terms of region, the global structural heart devices market has been segmented into North America (the U.S. and Canada), Europe (the U.K., Germany, France, Italy, Spain, and Rest of Europe), Asia Pacific (China, Japan, India, Australia & New Zealand, and Rest of Asia Pacific), Latin America (Brazil, Mexico, and Rest of Latin America), and Middle East & Africa (GCC Countries, South Africa, Israel, and Rest of Middle East & Africa). The market size and forecast for each of these regions and the mentioned countries/sub-regions have been provided for the period from 2016 to 2026, along with their respective CAGRs for the forecast period from 2018 to 2026, considering 2017 as the base year. The research study also covers the competitive scenario in these regions. The report also profiles major players in the global structural heart devices market based on various attributes such as company overview, financial overview, product portfolio, business strategies, and recent developments. Major players profiled in the report include Abbott, Boston Scientific Corporation, Braile Biomédica, CryoLife, Inc., Edwards Lifesciences Corporation, LivaNova plc, Lepu Medical Technology, Medtronic, Micro Interventional Devices, Inc., and TTK HealthCare.